Kids love dollhouses. They are a classic toy that has been around for ages and will probably never go out of style. These little play houses used to be beautiful creations that had to be put together and decorated. They were practically works of art. Today, things are a bit different. Dollhouse models are still available, but most people opt for something that is already put together and ready to play with right out of the box, or at least something that doesn’t take months of work to create. But there are so many options out there to choose from. Different doll houses hold different sized dolls, some are plastic, some are wood, there are big ones and small ones, etc. The choices go on and on. So here we’ve compiled a simple list of some of the best and most loved dollhouses available right now – 2019. To make it even easier, we have broken it down into age-specific groups – toddler to teens. If you’re shopping for a boy, click here to see which dollhouse to is best for them based on their age. This open and close style plastic dolls house provides a completely interactive experience for any child. The dollhouse is split over two levels, has four rooms and comes complete with some furniture and dolls and the option to buy extras. The dimensions of this dollhouse are 24.2 x 5 x 15.8 inches and it weighs just 5.6 pounds. 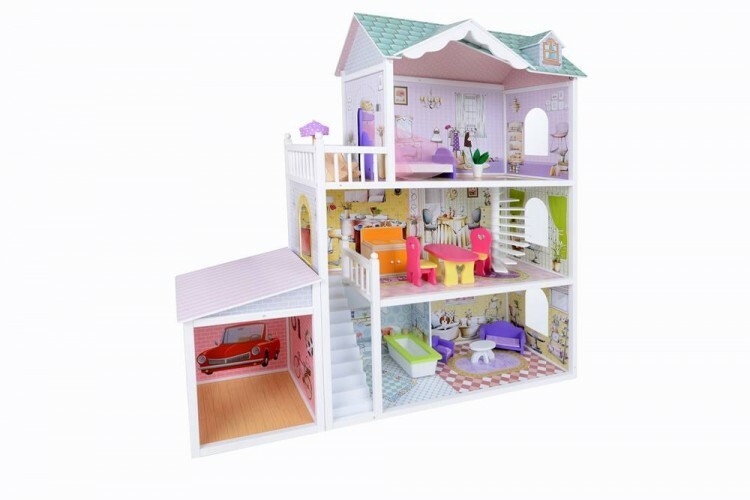 This is dollhouse is ideal for children aged one to five years. The level of interactivity is fantastic, with windows, doors and some items of furniture having working elements. Similarly, the range of over 50 sounds, songs and phrases improve the overall play experience. The downsides to this little house are only minor issues, so it is a good choice for a cheap first dollhouse for a child. 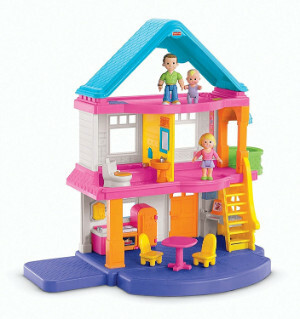 If you are after the best dollhouse for a toddler, then the Fisher-Price Little People Happy Sounds Home is possibly just what you are looking for. This house offers three tiers of fun and its dimensions are 41 x 8 x 16 inches. The product weighs 5.5 pounds. 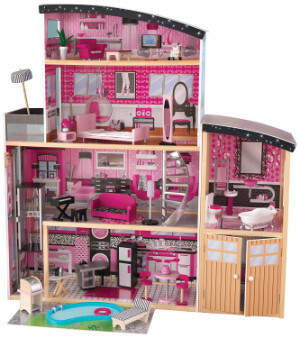 This one is best suited to younger children so it is a good option for a first dollhouse. The interactive aspects of this dollhouse mean that younger children can have lots of fun. Although there are quite a few cons for the Happy Sounds Home, they are minor issues that will not impact on the fun and enjoyment a toddler can have with this toy. 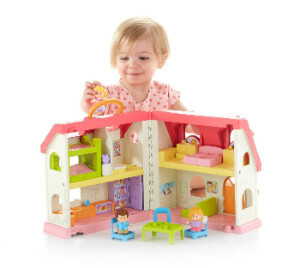 Lots of fun is to be had with mommy, daddy and baby at the Fisher-Price My First Dollhouse! There are several accessories and lots of room to provide for imaginative and safe playtime for your child. Each family member is just the right size for children’s hands. 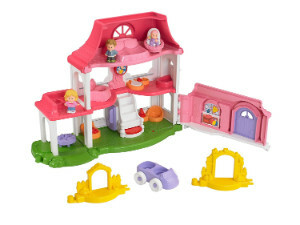 The Fisher-Price Dollhouse Playset is meant for younger toddlers ages 24 months to five years. It measures about 8.5 x 15 x 21 inches and weighs 7.2 pounds. This is an easy-to-play-with set that is gender neutral. The My First Dollhouse is marketed more towards younger children and their parents, but older children would probably enjoy it as well since it’s rare to find a child of any age who doesn’t like to play house. This little house is simple and small, but comes with a few fun accessories and three dolls to get your child’s imagination going. When looking for the best dollhouse for three years and over, few can compete with the KidKraft Majestic Mansion Dollhouse. With over 1,200 customer reviews and a constant Amazon bestseller, it remains one of the top picks for 2019. Split over four floors and featuring eight separate rooms, there is huge potential for different play scenarios for children. The big wooden dollhouse comes complete with 34 pieces of furniture, so the additional cost of buying extra pieces is unnecessary. The dimensions of this dollhouse are 52 x 14 x 53.5 inches and it weighs 61.7 pounds. If you are willing to tackle the assembly, this is a fantastic option that can bring hours of fun to a child. Unlike some other options, all the accessories you need are provided with this Kidkraft house. As it is made of wood, the construction is solid, sturdy and durable. With the exception of the tricky assembly and complaints about the elevator, there are very few negative reviews about the KidKraft Majestic Mansion Dollhouse. A search for dollhouses for kids will lead you to an almost endless list of products, but the Savannah Dollhouse by KidKraft is undoubtedly one of the best. This pretty dollhouse is split over four levels with six rooms and two balconies. A central staircase connects the first two levels. The Savannah house also comes complete with 13 pieces of furniture to furnish. The dimensions of this dollhouse are 33.9 x 13.8 x 51.2 inches and it weighs 13.3 pounds. 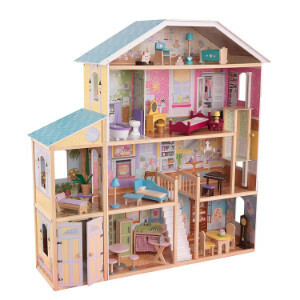 Overall, the KidKraft Savannah Dollhouse with Furniture is a good choice for children aged between one and eight years. The size of the house, the number of rooms and the amount of furniture provided combine to create a great play experience for children. The main complaint about this little house relates to how sturdy it is due to the materials from which it is made. However, the majority of people who have bought the Savannah house are happy with how sturdy and durable it is and also say it is relatively easy to assemble despite its size. 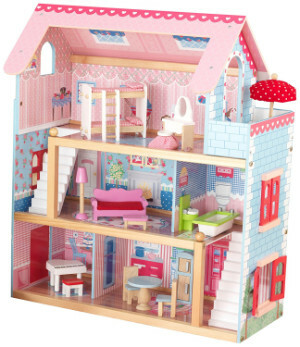 The KidKraft Chelsea Doll Cottage with furniture is split over three levels with two connecting moulded plastic staircases. It features windows that open and close and comes with 17 pieces of furniture. 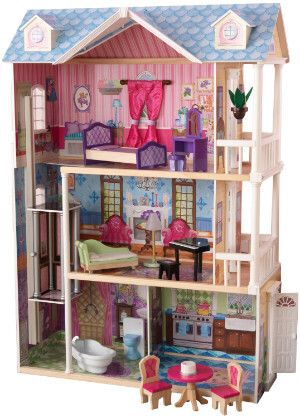 The dollhouse is designed to accommodate mini dolls with a maximum height of 4 inches. 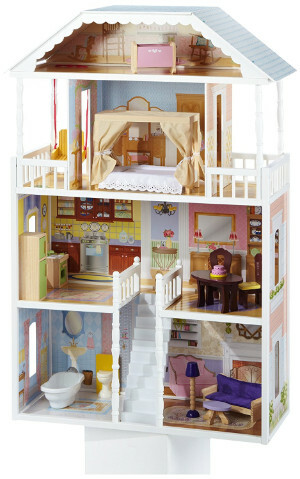 The dimensions of this KidKraft dollhouse are 24.5 x 13 x 28 inches and it weighs just 11.9 pounds. There are very few poor reviews for the Chelsea Doll Cottage and these are only minor issues. While some people complain their children cannot use Barbie’s in the house, the dimensions are clearly stated and there are plenty of other dolls that do fit in the house, including Polly Pockets. Similarly, some people have said the materials are cheap, but they are the same as many competitor products. Most people have said this is a sturdy and durable product. The Chelsea Cottage has the potential to give younger children hours of doll playing fun. The Melissa & Doug Fold & Go Wooden Dollhouse is one of the cheapest dollhouses available right now, however, it is also one of the most basic. This portable wooden dollhouse has two levels and four rooms. It comes complete with 11 pieces of wooden furniture and two wooden dolls with moveable parts. The dimensions of this are 12.5 x 7.5 x 10 inches and it weighs 4.7 pounds. Despite the rather basic design, this is still a good dollhouse for girls under five. Younger children will have lots of fun playing with the Fold & Go. As it is portable, they can take into any room rather than being restricted to one room which is a problem with larger dollhouses. You can even take this little house on vacation with you without it taking up too much room in your cases. Parents who struggle with the assembly of toys may prefer this doll house as it comes ready assembled with no effort required on your part. Many children and parents who are doll house fans believe that this is the best dollhouse ever. This huge house is split over four levels and has five rooms, a garage, an elevator and a balcony. It comes complete with 30 pieces of detailed furniture. Its dimensions are 49.4 x 25.7 x 53.3 inches and it weighs 22.1 pounds. If you set aside enough time and clear a large space, the assembly is not actually that much of an issue as the instructions are quite clear. However, the elevator not moving smoothly is something that many buyers have reported. Setting aside these two issues, the KidKraft Sparkle Mansion is a fantastic choice for parents looking for a gift to thrill their child. The house is large enough for children to enjoy creating many real-life scenarios in their play and the range of furniture means they will enjoy rearranging the interior design of the Kid Kraft house. 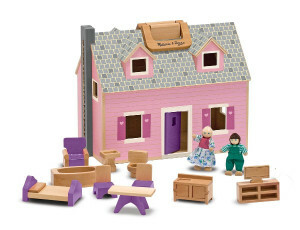 The KidKraft My Dreamy Dollhouse with Furniture comes with 14 pieces of furniture, including a hanging basket and a grand piano. There is also a gliding elevator that covers all three levels. The dimensions of this dollhouse are 33.4 x 15.5 x 47.8 inches and it weighs 42.8 pounds. One of the best features of this dollhouse is having items of furniture that make noise, such as the piano playing music and a toilet that makes a flushing sound. This adds an interactive element to playing with the Dreamy house. The gliding elevator is another interactive aspect of this toy, but many users have reported that this part does not work as well as it should. On the whole, this is a hugely satisfying doll house for any child and is a fantastic gift option. If you want a dollhouse that is very traditional in style and design, then look no further than the Melissa & Doug Classic Heirloom Victorian Wooden house. Both the interior and the exterior of this miniature house are beautifully designed in intricate hand-painted detail and the graphics differ in each room of the house. It is split over three floors and has five rooms. The dimensions of the dollhouse are 28 x 18 x 26.5 inches and it weighs 43 pounds. The main complaint of buyers is that you must buy furniture for the house separately at an additional cost and then it takes up so much room in the house that you can’t play and create real-life scenarios. However, some customers have overcome this by using different dollhouse furniture. The beautiful design is what the majority of customers have raved about with some saying they spend as much time enjoying the dollhouse as their child. The manufacturers suggest that this little house is best suited to children between six and ten years of age, but the opinion of parents is that their children will enjoy it beyond these years. There is a fantastic range of dollhouses available on the market to choose from and which is the best dollhouse will depend on the age of your child, what you are looking for in a toy, and your budget. Each of the houses reviewed here has its own pros and cons and will appeal to different people. If you have a limited budget or you are just looking for a basic first mini house for your child, then either the Fisher-Price My First Dollhouse or the Melissa & Doug Fold & Go Wooden Dollhouse are two of the best options. These are also the most suitable dollhouses for toddlers of the ones reviewed. On the other hand, if you are willing to splash the cash to get your child a stunning miniature house that makes a big impact, then either the Fisher-Price Loving Family Dream Dollhouse, the KidKraft Majestic Mansion or the Sparkle Mansion are three of the top choices. These are all suitable for children over three years and will last until they outgrow playing with dolls. 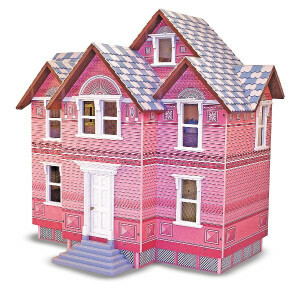 Traditionalists who desire a dollhouse that really looks like a house will adore the Melissa & Doug Classic Heirloom Victorian Wooden Dollhouse. Not only is this the most realistic looking, but it is also one of the best little houses for older children. Some of these dollhouses have been available for years and some are new to the market. All, however, have great reviews and we believe are the best on the market in 2019. 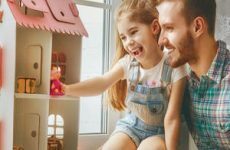 Regardless of which of these dollhouses you choose for your child, each can offer hours of fun creating real-life scenarios with their dolls, mini house and furniture.